Diastasis Recti - 5 things you need to know! 1. it's not just about the gap! Diastasis can sound really scary once you start looking for information and there's a bit of an obsession about the gap down the middle of the six-pack. We use the gap to measure the distance between the two belly's (see image 1) BUT you can have a gap and still have stability! That's the important bit! Human nature is amazing, the connective tissue down the centre of the tummy muscles stretch to accommodate your baby. After childbirth, the distance can remain increased but you can still have a functional and stable core that is able to maintain pressure when lifting, sneezing and coughing etc. 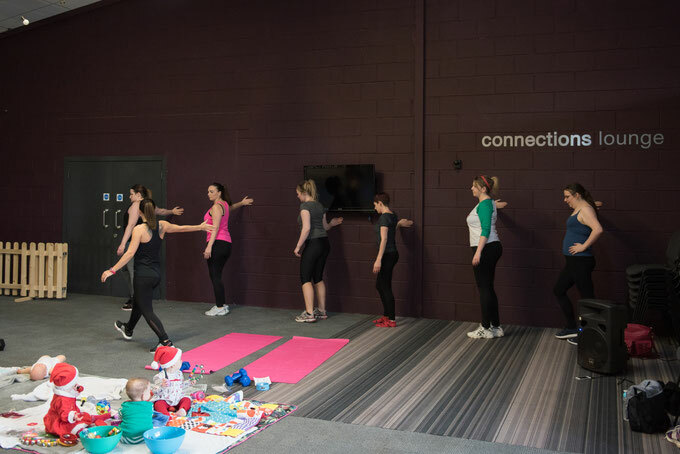 When checking for diastasis we can feel for this stability and tension by activating the pelvic floor and core whilst exhaling, if there is a lack of tension then this would need to be looked at further. Our Move with Mumma members receive a full postnatal assessment home visit to check this and more. You are unique and your diastasis programme should be too! DRINK MORE WATER and herbal teas. Water and being well-hydrated is vital for recovery. Your goal is minimum 2 litres water/fluid per day (more if breastfeeding and exercising), this can include unlimited fruit / herbal tea. Adding sugar-free squash to water can help you drink the amount required. Consuming sugar in large amounts in cakes and biscuits etc, is detrimental to healing your body. You have to work hard at this one, but it’s worth it, the inflammation it causes will reduce the potential for healing and fat loss. DUMP THE JUNK & PROCESSED FOOD. Eat & drink natural, unprocessed foods for maximum nutrition and natural energy. Your body needs maximum nutrition after pregnancy, birthing and during the Post Natal period. Remember, you are healing! And as we know processed food is full of trans fats, sugar and will not take you towards your goals! Period! At every meal, it’s vital for tissue recovery. GOOD FATS to provide energy, spare protein for your repairing tissues as well as aiding your body to absorb vitamins. A deficiency in essential fats can affect wound healing and can also play a role in Postnatal Depression. So get those avocado’s into your salads, cook with olive oil and eat raw nuts like walnuts, almonds and cashews. Vitamin A, Vitamins B12, B9 & B6, Vitamin E, Vitamin C. Vital for wound healing! These also reduce inflammation, stabilise mood and promote brain health. Coconut Water Smoothies - Arginine in coconut water increases blood flow and therefore oxygen and nutrients to wound site. You will get a natural sugar kick from mixing it with fruit, see the berry suggestions on the previous page. 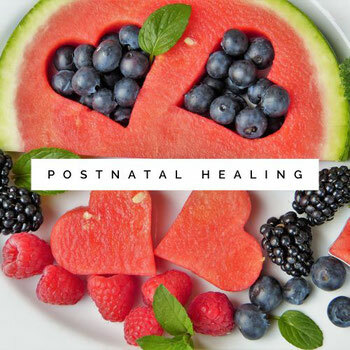 Check out our Postnatal Healing Blog Post for food ideas and recipes. When I say start with the basics, I mean the basics! Are you breathing optimally? My ladies hear me talk about exhaling and pelvic floor lifting in their sleep!!! We need to reconnect our breathing to our core and pelvic floor, this is something that can become disrupted during pregnancy and the more you practice the better. Start now with daily activities and practice 'exhale on exertion' constantly. Every time you pick your baby up, exhale for tension around your core. 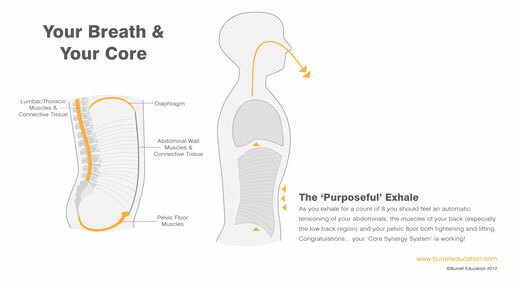 Every time you go from laying or sitting to standing, exhale for tension around your core. We can progress onto safe full body exercises which integrate core work, a great way to do this is using resistance bands whilst focusing on the breath and core. This is something we work on in all our classes! Your first session is FREE, click here for more information. Check out our video here on how to connect your breathing and pelvic floor lifting. Advancing the core work safely with resistance bands. Manage your stress better - elevated cortisol retards healing. When your baby is napping take 5 minutes for yourself - check out our 'Take the Time to Breath' blog post and follow the simple mindfulness exercise. Take a look at your posture - ask someone to take a photo of you from the side. Posture can be massively affected by pregnancy and new-mum life. Often in the upper body, the chest is tight and the back is weakened which can be seen as a slouch with shoulders rounding forward. Often in the lower body, the glutes are weak and the hip flexors are tight which can be seen as an anterior pelvic tilt (bottom sticking out and back arching in). Correcting these will help your diastasis healing, this can be done with stretches and exercises (see image) and this is something we work on in all our postnatal sessions. Soft tissue therapy on the surrounding muscles to release tension, everything is connected through the body so by getting a massage to release the stuck tissues you will free those tight areas and reduce any pulling of the mid-line. 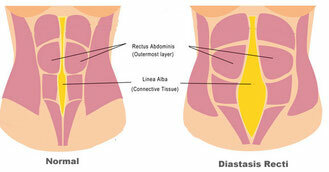 Take a look over at Burrell Education for more information on massage strategies for diastasis. 5. forget crunches & planks! Crunches, Planks, Sit-ups, Mountain Climbers, Russian Twists, Leg Raises. These exercises are not the way to a flatter tummy! These exercises may cause further damage to your pelvic floor and increase the risk of developing diastasis (abdominal separation). It doesn't mean you'll never do them again but you certainly need to be nailing the basics before even thinking about these. 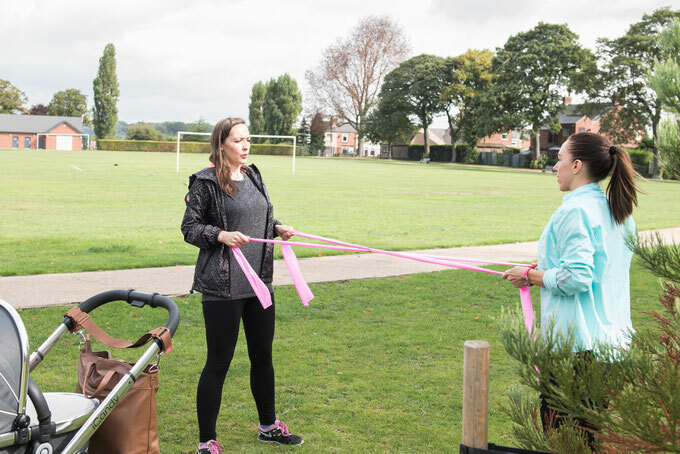 Your first Move with Mumma session is FREE, simply book online and complete your health form. If you decide that you would like to join us then your health assessment will be included in your block booking, Manda will arrange an appointment to visit you at home to take a look at your postnatal recovery and provide you with your unique healing plan.